Not the thickest rug but good buy for the money. Would feel better with a felt rug mat underneath. The ombre effect is nice. Good buy and looks great in my bedroom. Would buy again. Inspired by global travel and the bold, colorful motifs adorning fashionable ski chalets, Safavieh translates rustic lodge style into the supremely chic and easy-care Adirondack collection. 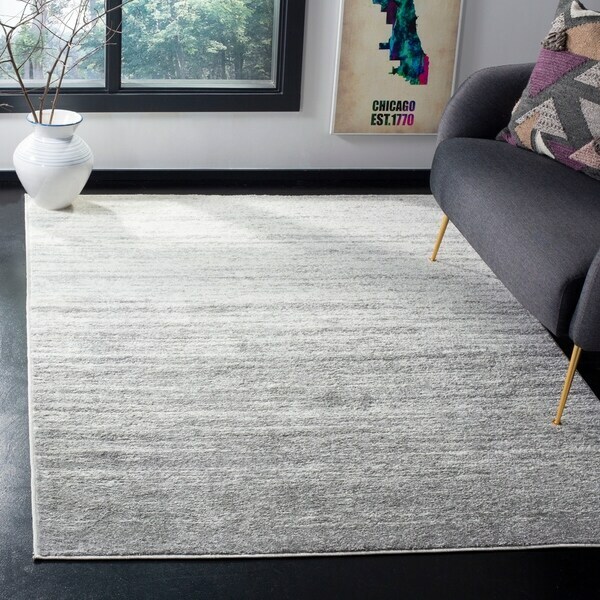 Made using supple synthetic yarns, Adirondack rugs explore stylish over-dye and antiqued looks, making striking fashion statements in any room. This collection is power loomed in Turkey. 1: back color IS light ivory – see pic of room with white curtains & compare to rug for color. 2: “silver” color is medium dark gray - no shine. 1 end is mostly ivory – with gray striping graduating to near solidly gray at opposite end. I have a bed covering large part of the darker end – but flip which way you prefer if darker gray helps you with foot traffic. 3: rough backing / no padding – definitely get a rug pad. HIGHLY recommended by me: ¼” “reversible” NATURAL rubber rug pad that is “felted” on 1 side (this is NOT soft felt, slightly scratchy/plastic material that is supposed to GRAB the roughness of the rug backing). Advice: put UP “felted” side to hold rug in place. Put natural rubber to floor - prevents slippage + protects rug/floor + feels softer to foot. My pad cost approx. $60- 70. You can buy cheaper ones, but do your homework. Cheap synthetic/thin pads can fall apart/melt and imbed themselves in your floor. Happened to my MOM with a 2x3 throw rug that she washed all the time (it’s not like sat there for years and she didn’t notice like with a heavy area rug). Just saying. This rug is gorgeous, I have purchased many of them for my staging. 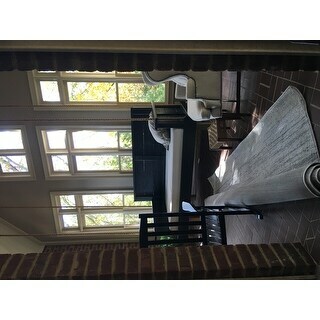 This Safavieh Adirondack Vera Ombre Ivory / Silver Rug - 8' X 10' rug was purchased for my dining room. It looks beautiful. Made well. Soft. Safavieh Adirondack Vintage Ombre Ivory / Silver Rug (8' x 10')- beautiful rug and great quality for the money- Love the color it has a hint of silver with the Ivory for some extra flair - it looks very expensive and was a great buy for the money. I am using it under my dining room table - so I cannot comment on how it would hold up to heavy traffic areas - Shipping and packing were good. Description is very accurate! The color is slightly darker than the picture but it is still a light color. The rug is on the thiner side, definitely not plush, but I knew this when I placed my order and for me it works perfectly! If you want something on the more plush side I would recommend using a rug pad. I am very pleased with how this rug works in my great room and would not hesitate to recommend! Neutral colors & design & very soft. This is my 4th Safavieh rug purchase. I really love this brand as the rugs weather and vacuum very very well. I have a dog who loves to roll on rugs to scratch her back and none of these rugs have snagged. They have a tight weave, and don't take in a whole lot of dirt. As stated, the grey is a bit darker than in the photo. I would call it a 'dolphin' grey if you are trying to visualize. I've looked at many rugs costing four times as much...and this a favorite of mine! Waiting to pick up a pad for my brick floor since the rug isn't very thick but it IS full enough; you're not able to see surface of rug-so thick enough for me. The ivory isn't in the yellow family but more in the silver/white family. Beautiful color! The grey is darker than the pictures...but still soft in color. I've rubbed over the rug several times with NO shedding. I am giving this a 5 stars because for an indoor/outdoor carpet it is soft. However the picture shows it much lighter in color than it is. It is very gray and has an ombre effect. It is really dark gray at one end. I sent it back because it was as light in color as I hoped. If you want a really gray color then this is the right one for you. We absolutely love the Safavieh Adirondack Vintage Ombre rug. The fabric is soft yet not too thick, making the rug a comfortable place for our feet. Storage bins slide over the carpet with ease as well! Absolutely Gorgeous Rug. The colors are beautiful. The quality is very good. I love safavieh rugs, they are the best. I would recommend this rug. I was so excited to receive this as it looked beautiful online. 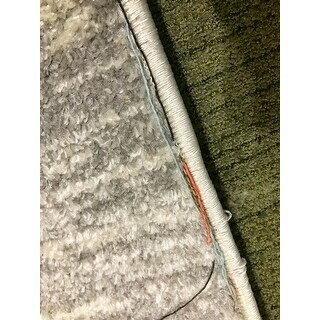 Got it in 8x10 and unrolled it to find what looks to be different colored threading for a whole different rug all along the edges. Scared to cut them off and unintentionally unravel the rug... so it's off to be returned. *** when you order such a large item and then have to repackage it up again to be sent back! Darker color than the picture. completely satisfied with this purchase. Delivery came sooner than expected, arrived in perfect condition is exactly as the photo on the website amd description indicated. It looks perfect inmy bedroom and is soft on bare feet. Really love it. We put this in our sunroom where my husband teaches guitar lessons and we love it! It is a high traffic area and you can see the parts where it’s worn but for the price we are happy with it. This is a very high quality rug, like all of the Safavieh rugs I have owned. Also like all rugs I've owned, upon purchase the ends tend to curl upward, so I just put a few weights on the ends for a night and then the next day they are flattened out. The rug looks just like the images. The rug was exactly like in the pictures. I love the look, would definitely recommend to others. It looks like a $400 rug for $***. Great buy!!! Looks beige in person with grey tones. 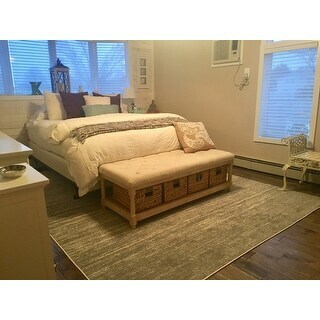 We placed this rug in my husband's home office, and it looks great, especially with gray curtains. It provides the perfect complement to wood floors and is masculine without being too dark. This rug is absolutely beautiful. The packaging was awesome which allowed for it to arrive in perfect condition. Great rug! Made our living room look so much more homey. Feels terrific under our feet. It's beautiful and great quality for great price. It's thicker than I thought. I am very happy with this rug. "What are the exact measurements of this rug?" I would love to know this as well because I need a rug that is at least 10 feet 4 inches long for it to look right where I'm putting it. No. I bought this rug on November 2016 and it still look the same as the day it was delivered. This rug should experience minimal to no shedding. "how easy is this rug to clean from pet accidents? can you hose it off? or does it need to be professionally cleaned?" "Does this rug come in wool?" This rug is not available in wool.